The information on this page will help landowners and other parties responsible for land contamination decide if they must report the contamination to the EPA. 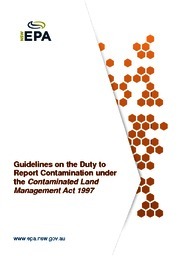 If your activities have caused land contamination, or you own land that is contaminated, you have a legal duty under section 60 of the Contaminated Land Management Act 1997 to notify the EPA. Note: As the new contaminated land notification form is now available, reports on the old form will be only be accepted until March 31, 2018. From 1 April 2018, all reports of land contamination must be made using the new form. The EPA publishes a List of NSW contaminated sites notified to the EPA, which indicates that the notifier considers that the site is contaminated and warrants reporting to the EPA. For more information or advice, phone Environment Line on 131 555.